I’m starting to gather together and make a few tools that will be dedicated to lutherie, that is, the building and repair of stringed instruments which are usually made of wood. Having a dedicated lutherie kit will just make my life easier than walking back and forth in the shop grabbing the needed tool. Many of these will likely end up in a stand, box, or drawer for easy access while doing repairs. 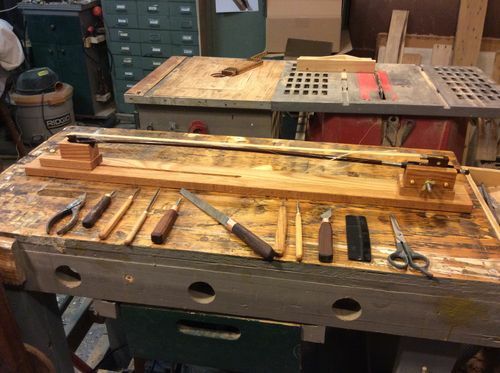 From the sound of things, learning to re-hair violin bows and the like is a good, lucrative goal, so these first tools will be generally for that purpose. Some will have a wood component, but a few might not. - Neck clamps for Violin, cello, etc. I think you’ll like the bow vise when I get to it. I’ve alphabetized the list to neaten it up. Mojose! Mi jam vidis vian zimbalonon, sed ĉu vi iam faris gitaron aŭ violonon? Se ne, ĉu vi intencas fari ilin aŭ nur ripari ilin? Ne zimbalon, sed dolcimeron. Zimbalon oni frapas per marteletoj. Dolcimeron oni plektras. Mi havas en mia listo intencon fari rondsuban violonon, skatol-gitaron, kaj eĉ biskvitujan banĝon. I’ve added an improved hair gauge and a bridge fitting jig to the list above. Just added sound hole clamps to the list. Added the string jack to the list. Just added a link to my brass sound post setting tool.